Parted Magic is a Linux-based bootable disk with disk partitioning and data recovery tools. It is free (as freedom) software under the GPLv2 license. It was available for free from its homepage and various websites like SourceForge.net. After the Parted Magic 2013_08_10 was released the ISO is no longer freely available for download from the official website. The distribution moved to a pay-for-download service. Old and unstable images were still available for a few weeks on SourceForge and other websites. There is currently no official way to download the ISO freely, although it’s legally available through other download services due to Parted Magic Linux distribution being GPLv2 licensed. The source code is not made public in the official website, it should be provided by request, as stated by the GPL license Parted Magic is under. The 2013_08_01 is the last known version officially available for free as an ISO image and known to cause problems on certain computers (more in the update 3 below). The pxe variant of the fixed 2013_08_10 was briefly available on SourceForge. Old versions were still mirrored on some websites. I’ve found a mirrored copy of a 2013_08_01 iso on MajorGeeks and a 2013_08_10 pxe version somewhere else. I haven’t found the 2013_08_10 iso version so I’ve decided to make a 2013_08_10 iso from these two. I’ve extracted the main SQFS archive from the 2013_08_10 pxe (it was inside initrd.img) and replaced the one inside the older 2013_08_01 iso image using IsoMaster. That was the most important file containing the main filesystem. I’ve replaced all files that are present in both iso and pxe versions including contents of the initrd.img. Testing under VirtualBox shows that it works and reports version 2013_08_10 under HardInfo. 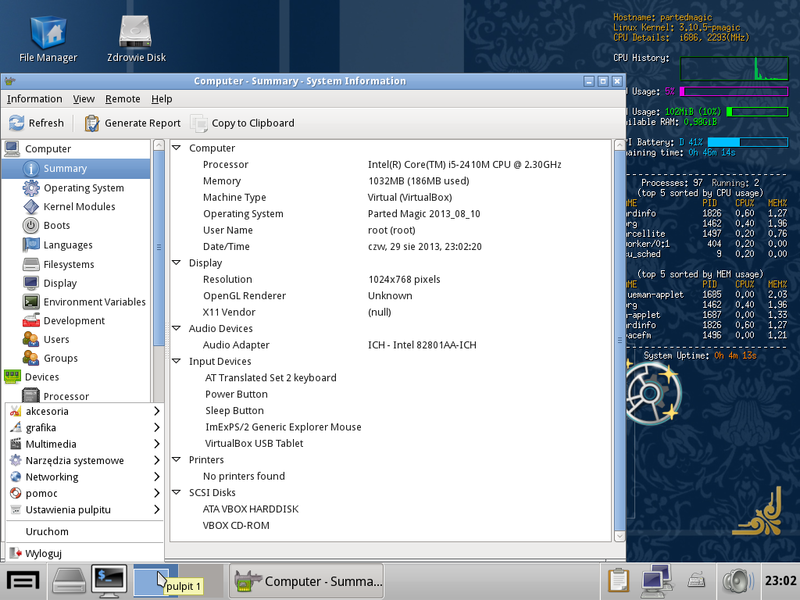 Conky also shows a newer kernel version. I’ve edited the boot menu so it reports the correct version in the boot menu, and it launches that version using SQFS files from the 2013_08_10 pxe. My custom Parted Magic 2013_08_10 iso is named pmagic_2013_08_10_reconstructed.iso. Based on Phooen‘s feedback I’ve fixed the broken 64-bit boot option and the new image is: pmagic_2013_08_10_reconstructed_v2.iso. I’ve posted all images I’ve found below. Use them at your own risk. All these images were mirrored when they were freely available (it’s still GPLv2). This post is just an archive of the last free versions. You’re free to mirror this post and/or links to these old free versions. I’ve replaced my reconstructed 2013_08_10 iso version with a new version built using the 2013_08_10 pxe and menu configuration files from the 2013_08_09 iso instead of the 2013_08_01. This made Dutch, Turkish and Ukrainian translations usable. Please use version 2013_08_10 or newer to avoid critical bugs present in the 2013_08_01. As a safety precaution don’t use the Secure Erase GUI on USB devices. You can find recent versions on the list of mirrors, which has been prepared on the basis of comments made by users, received messages and my own research. There are many free alternatives like UBCD Live, SystemRescueCD, GParted-live or LiveCDs of the most popular linux distributions like LinuxMint. You’re free to mirror this post/links/iso images. This entry was posted in Computers, GPL, Linux, Personal blog and tagged 2013_06_15, 2013_08_01, 2013_08_09, 2013_08_10, clonezilla, distribution, freeware, gparted, gparted-live, GPL, iso, linux, Magic, majorgeeks, mirror, Parted, PartedMagic, pxe, recovery, rescue, sourceforge, ubcd live, yumi by mrsebe. Bookmark the permalink. There’s only a 2013_08_10 pxe network boot version. Second link from the bottom of the page. If you have problems with mega.co.nz use jdownloader 2 to download files from such sites. It’s his decision. There are sources on his website (http://beefdrapes.partedmagic.com/source/). I’ve bought a 2013_11_11 iso and the Polish translation has a few issues. Some captions are only partially translated like someone just picked words from a dictionary. I don’t know why somebody translated “Magic” from Parted Magic to Polish. Check disk health was translated as “Dysk twardy inspekcji sanitarnej”, terminals section as “zaciski”. Yes, you are right about the sources, at first I didn’t notice them. I agree, the Italian translation is “sad” as well. I still have a copy of Parted Magic from around June 2012 and I like it a lot more, and still use it. Also, it recognizes a damaged hard drive which both the new one and also Ubuntu 13.10 fail to read. It’s strange! Are these images the “non-PAE” versions? There are still LOTS of perfectly servicable machines in use that do not have PAE-capable processors, but the “standard” version of PM requires PAE. X86 versions from 2013_09_26 do not require the Physical Address Extension (PAE) computer processor feature. Older versions did. There was a i586 version up to 2013_08_01 but it was removed (https://web.archive.org/web/20130825160807/http://digitalincursion.net/parted-magic/). I’ve found a mirror: http://ftp.psu.ru/linux/partedmagic/. Could you share in mega the ‘sqfs’ file contained in pmagic_*.iso, PLZ? It’s lower in MB that iso file, right? In that way we just need update our sqfs file, keeping the old sqfs name’s… It’s just an idea! I’m not the uploader of these images (just 2013_08_10 and older). Sqfs image is not the only file updated from version to version. For example the Linux kernel is stored in a separate file. Thank you for your detailed information on Parted Magic. I’ve finally got Parted Magic 2013_08_10. However, I’m not sure how, but I cannot boot “Default settings 64 (Runs from RAM)” with a CD burned from “pmagic_2013_08_10_reconstructed.iso”. Of course Parted Magic can start from “Default settings 32 (Runs from RAM)” and work well on 32bit machines but some tools of Parted Magic, such as File Manager, cannot work so well on 64bit machines. I would appreciate if you could advise me in this matter. CD: 32-bit works, 64-bit doesn’t. USB (unetbootin): 32-bit works, 64-bit works (!). -Ignore it and use 32-bit mode. 64-bit mode makes no difference (supports more RAM) and it’s pointless for a recovery distribution. -Use Parted Magic 2014_09_29 (the bottom of the page). Old versions like 2013_08_10 have more bugs and worse hardware support. It’s good to know that the cause is its bugs. I think Parted Magic would be used mainly to run Secure Erase or to rescue files in case an OS crashes, so 32bit mode would be useful enough. I asked the question because I would like to introduce this blog and your “pmagic_2013_08_10_reconstructed.iso” as a FREE Parted Magic on my blog in Japanese. Would you mind if I do that? I don’t mind. It’s GPL. 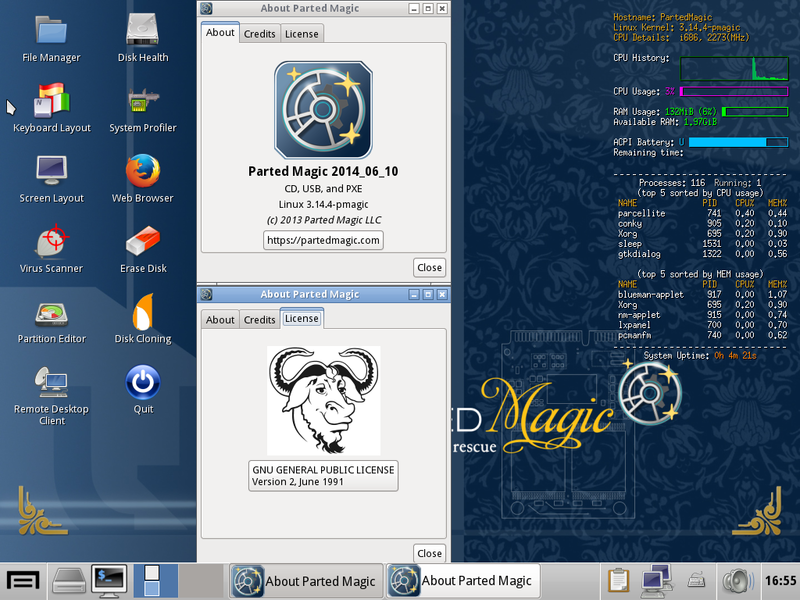 64-bit mode is fixed in the pmagic_2013_08_10_reconstructed_v2.iso. Thank you for posting the link to my blog. Unfortunately, it’s written in Japanese, though. Thank you so much and Emilio! does anyone have an entry for grub4dos? I don’t use grub4dos. 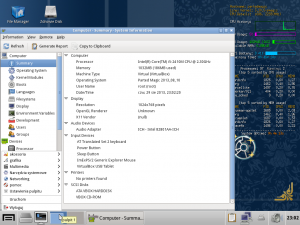 Multiboot usb can be made using yumi.